A to-do item is any task, big or small, that you are responsible for completing. A to-do item can be any note, email, task or piece of work that has been assigned to you by a colleague or yourself. This can include any email that you assign from Triage to action later. Each of these four types of to-do items display a unique icon. When collapsed, a to-do item displays, from left to right, its name, status, due date, and time since last activity. 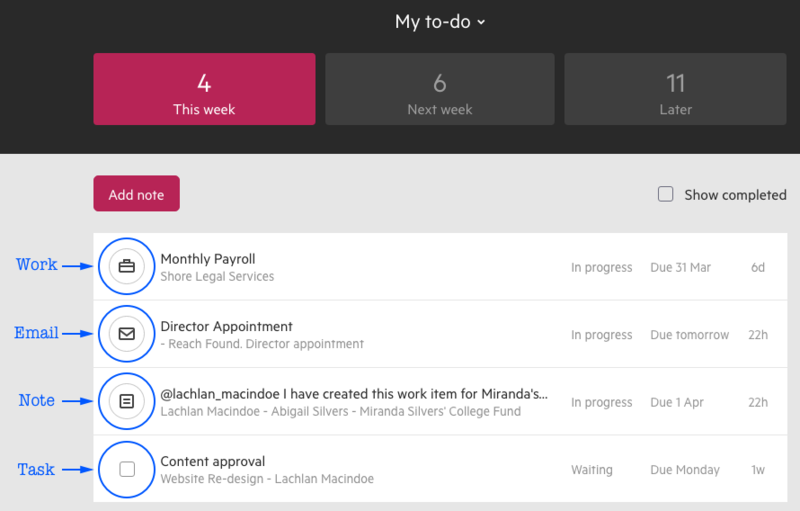 Notes, emails and tasks will also display the piece of work they are attached to. If emails or notes are not attached to a piece of work, they will display the contact they relate to.